Everyone we knew growing up loved eating pop tarts. It turns out, they are way easier than we thought! We used our pie crust recipe and added a little extra sugar. A little store-bought strawberry jam (or whatever kind of jam you want; we like blueberry, too!) for the filling and you are good to go! We wouldn't say they are more nutritious than the store bought variety, but they definitely have way less processed ingredients and gross things inside of them. And yes, we actually love the homemade ones. They are way better than store bought!! Pulse together the flour, shortening and butter, and salt in a food processor until small crumbs form. You can also do this by hand with a pastry blender. Gently mix in the beaten egg to the flour mixture. Mix vinegar with ice water. Then slowly (Very slowly and very gradually) pour water mixture into food processor while pulsing. Stop when the dough forms large soft crumbs and pulls away from the side of the bowl. Remove dough from food processor and divide in half. Gently form the dough into a ball. Place on a piece of saran wrap and cover. Gently flatten with your hand so it makes a short disk. Repeat with the other half of the dough. It is really important not to over work the dough, because it will become tough very easily. Chill in the refrigerator for an hour (30 minutes works if you're short on time!). Roll one ball of dough into a long rectangle. Leave the other ball of dough in the refrigerator so it will stay cold while you work with this dough. Cut into eight even rectangles. Place four of the rectangles on a parchment paper lined baking sheet. Spread about a Tablespoon of jam onto each rectangle, leaving a nice little border around the edges. Lay a rectangle over each jammed rectangle. Use a fork to crimp the edges together. Then pierce the top of each pop tart about four times with the tines of a fork. Repeat with the other ball of dough. Flash freeze the pop tarts in the freezer for about an hour (or longer if need be). Preheat the oven to 350 F. Bake the pop tarts for about 25 minutes, or until very lightly brown. Whisk together the powdered sugar and milk. 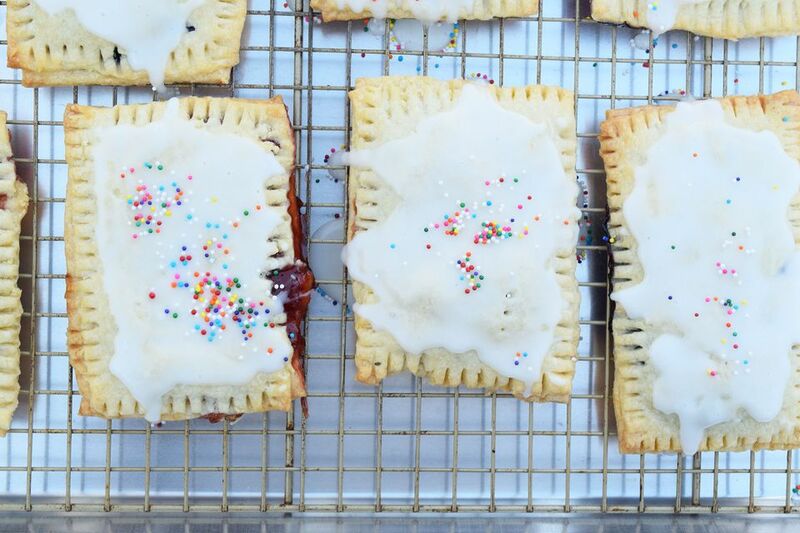 Spread the frosting over the cooled pop tarts and sprinkle with sprinkles if desired!